Once per turn, Han Dang can discard a card to make his attack range unlimited. If the discarded card is a piece of equipment, he can discard a card from another player. Single-Use Ability: During his action phase, Han Dang can select any character. Every character that has them within their attacking range must discard a weapon card or allow the target to draw one card. 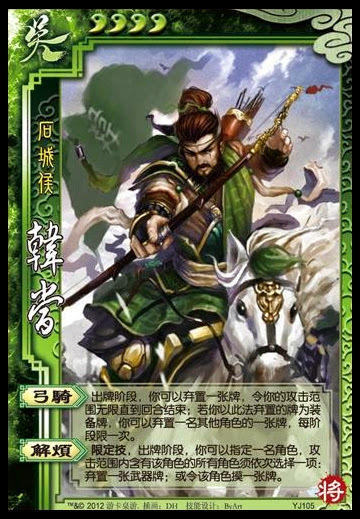 New Han Dang can discard any card to activate "Horsebow," from his hand or in his equipment area. The targeted character of "Relief" has themselves in their attacking range, so they can allow themselves to draw a card when this ability is activated. Characters that have the target of "Relief" in their attack range can discard any weapon, equipped or in their hand. New Han Dang is an improvement over the original Han Dang in the sense that his abilities are much less confusing than those of the former, but it is difficult to tell whether or not New Han Dang will be just as effective. Perhaps the biggest problem with New Han Dang is that he is not exciting to use. Only one of the two authors of this website has bothered to try using him in an actual game. After we force ourselves to use him in a few games, we will give you our full analysis of New Han Dang.